Rajaji Tiger Reserve (earlier Rajaji National Park) is located in the Shivalik range of Himalayas and spread over 820 kms. It covers a part of over three districts of Uttarakhand: Haridwar, Dehradun and Pauri Garhwal. It is now become the second Tiger Serve of Uttarakhand after Corbet. The park has been created in 1983 by amalgamation of three sanctuaries - Rajaji Sanctuary (estd. 1948) Motichur sanctuary (estd. 1964) and Chilla sanctuary (estd. 1977). On 20 April 2015 it has been changed to Rajaji Tiger Reserve. All the gates of Rajaji National Park has been opened on 15th November 2017 and will be closed on 15th June of 2018 for this winter session. The forest rest houses situated in the circle of this Rajaji National Park are also opened for the same time period. These opening and closing dates are same for Corbett National park too. Jeep Rate: Rs 1500 per safari and 150 per person. Note: Like Corbett, two time day visit facility at Rajaji Tiger Reserve is also available. Other than this, day and night stay facility at Rajaji National Park is also available. For this, only manually booking option is available. Permit facility to enter in Rajaji and Gypsy facility are available at the Gates of this national park. The forest rest houses in Rajaji National Parks are available at Asharodi, Motichur, Chila, Ranipur and Beri Bada. To stay in forest rest houses, you have to get the permit from Park Director's Office, Dehradun firstly with all the booking formalities. The park normally opens at 0600 hrs in the morning and is open till about 1100 hrs in the morning. However, tourists who are booked for a full day safari spend the time from 1130 Hrs - 1300 Hrs at any of the rest houses inside the forest and do bird watching. In the afternoon the park timings usually are from 1430 to 1730. 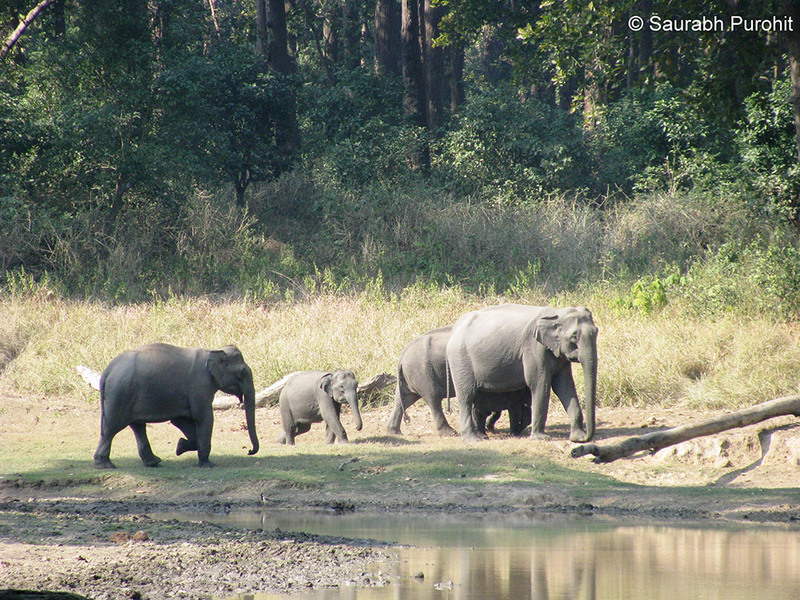 Depending on the season the timings change locally which the forest authorities of Rajaji National Park notify. All the Safari's are booked by the Forest Department and it is completely at the discretion of the forest department. Rajaji National Park contains tropical and subtropical moist broadleaf forests, in particular those of the Upper Gangetic Plains moist deciduous forests ecoregion. The forest ecosystems of the Park are quite varied and diverse. Plants such as shorea, mallotus, adina, terminalia, bridelia, dalbergia, acacia, syzygium and Phoebe are found in the Park. It also the bird watcher paradise as there are 315 species of birds are found in the Park. The most prominent avian species include pea fowl, woodpeckers, pheasants, Hornbill, kingfishers and barbets, supplemented by a number of migratory species during the winter months. The rivers which flow through the Park harbour species of fish such as trout and mahseer. Jungle Safari: Rajaji Tiger Reserve is second tiger reserve in Uttarakhand after Jim Corbett and home to myriad species of animals like Bengal tiger, Asian elephant, leopard, sloth bear, Himalayan Black Bear, King Cobra, Jackal, Barking Deer, sambhar, goral to name a few. Bird Watching: Along with the animals, there are more than 300 species of birds both resident and migratory including great pied hornbill, pied kingfisher, fire tailed sunbird, kingfisher, pheasants and barbers along with several other aviary species. Rajaji Tiger Reserve is home to many rare species of flora and fauna. Be a responsible tourist and abide by the guidelines outlined by the forest authorities. The entry fee for the Indian tourists is 150 rupees and for foreign nationals is 600 rupees. The cost of Jeep safari is 1500 rupees. The Tiger Reserve is remains closed during the rainy season. It is wise to check with local authorities, tour guides or tour operators about the weather and road conditions during monsoons before you actually start your trip. Best time to visit Rajaji Tiger Reserve is from November to March. The weather remains pleasant during this time. Rajaji National Park has been named after C. Rajagopalachari (Rajaji), a prominent leader of the Freedom Struggle, the second and last Governor-General of independent India and one of the first recipients of India's highest civilian award Bharat Ratna (in 1954). What is Rajaji Tiger Reserve famous for? Rajaji Tiger Reserve is famous among tourist as Tiger Reserve with Jungle safari. Rajaji Tiger Reserve is recommended destination for Corporates, Couples, Foreigners, Groups. Rajaji Tiger Reserve is popular destination for following activities/ interests - Adventure, Bird Watching, Emerging Destinations, Safari, Tiger Reserve, Weekend Getaway, Wildlife Tourism. Travelling to Rajaji Tiger Reserve in 2019? Contact us for planning your Rajaji Tiger Reserve tour with best travel packages of as per your requirements!